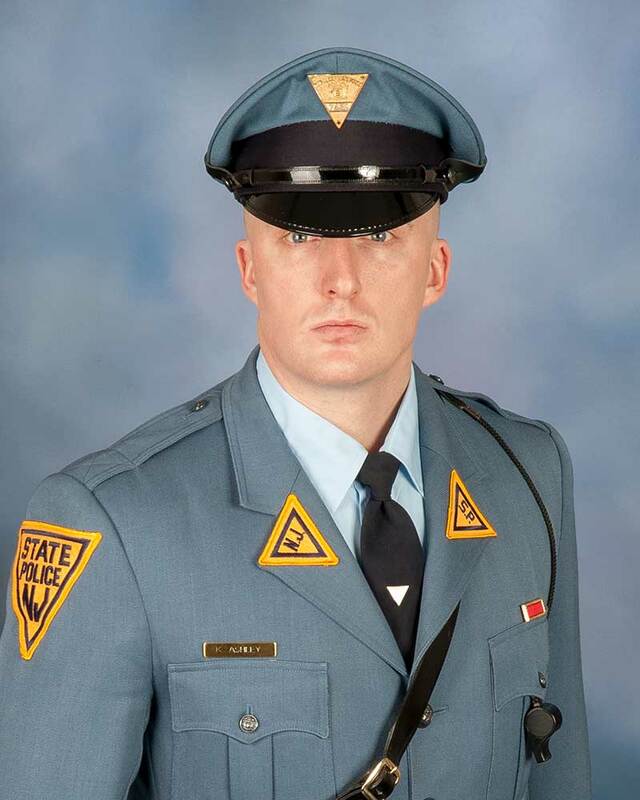 West Trenton, N.J. - Earlier today, Attorney General Gurbir S. Grewal and Colonel Patrick Callahan announced that Trooper Keith Ashley, of Troop “C” Hamilton Station, is the recipient of the 2018 Trooper of the Year Award for spearheading 103 criminal investigations, which resulted in the arrest of more than 300 suspects for a variety of offenses including child endangerment, evidence tampering, narcotics possession and distribution, and weapons possession during a one-year period. Trooper Ashley conducted complex and thorough investigations, often working cooperatively with members of the Troop “C” Criminal Investigation Office, the Troop “C” Strategic Initiative Unit, the Crime Suppression Unit, and the Gangs and Organized Crime Unit. As a result of his outstanding efforts, he was able to cultivate six confidential informants, which ultimately led to the arrest of a MS-13 gang member who was in possession of two handguns and a distributable amount of synthetic marijuana. Overall, Trooper Ashley recovered more than $10,000 worth of drugs and contraband, and seized nearly $20,000 cash. In addition to his criminal investigations, Trooper Ashley established himself as a top performer in traffic enforcement, which included arresting 26 individuals suspected of driving while impaired. Many of his traffic stops resulted in the seizure of narcotics and drug paraphernalia. During one stop, he seized 67 doses of oxycodone, more than 12 doses of hydrocodone, approximately 6 grams of crack cocaine, and $6,600 cash. In May, Trooper Ashley assisted two unconscious individuals who overdosed on heroin by administering Narcan, which is an opioid antagonist that can partially or completely reverse the effects of an opioid overdose. Every year, the New Jersey State Police selects an enlisted member or members to be the recipient of the “Trooper of the Year Award.” Recipients are awarded a red ribbon encased by a gold frame, which is to always be worn on the uniform. It is the highest honor a trooper can receive from within the Division. All recipients are honored for their outstanding performances, an honor which reflects great credit upon themselves and the New Jersey State Police.